Washington National Airport (IATA: DCA, ICAO: KDCA, FAA LID: DCA) is an airport near Washington, D.C.. It is in Arlington County, Virginia. 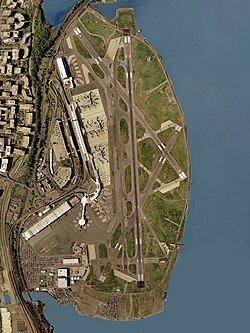 It is the commercial airport closest to Washington, D.C. The Metropolitan Washington Airports Authority (MWAA) is in control of the airport. It is named after Ronald Reagan. ↑ "Ronald Reagan Washington National Airport (DCA) Air Traffic Statistics". Metropolitan Washington Airports Authority. 2011. Retrieved June 7, 2011.